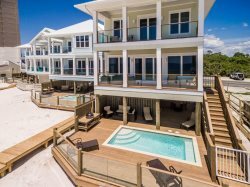 Gone Coastal is a 5 bedroom 6 full bathroom home that sleeps 16. This beautiful home is located on the west end of Panama City Beach just steps from the beach. Gone Coastal has a large front yard, perfect for yard games. Step around to the side of the home and enjoy the large private heated* pool (*option to be heated for additional cost) area with a BBQ grill. Relax on 2 balconies facing the beach. Gone Coastal has top of the line appliances in the kitchen. Enjoy hanging around on the kitchen island or sitting down with each other at the large dining table. Wow! What an amazing house! We had a party of 8 adults and everyone slept comfortably. There is so much room that we didnt feel cramped. The pool was an awesome bonus. Waking up with a cup of coffee on the top balcony seeing the ocean was a great thing. All of the appliances are top of the line. I think we all left wanted to go buy a fridge like that. We cant wait to book it again! I cannot rave enough about this property. It was absolutely perfect for our party of 10 people. The kids room with the 6 built in beds was amazing and worked perfectly for the three children we had in our party. There are 5 beautiful bedrooms, each with their own private bath, except for one room. The pool was so nice and the heater worked perfectly. The balcony is such a nice touch, and the loft area across from the balcony is a great place to hang out and even has a full bathroom. The kitchen is the most beautiful kitchen ive ever had the joy to use. It has all the necessities that anyone could ever tjink of. The staff at Holiday Beach are so amazing. They are so great to work with and I cannot recommend booking with them enough. They really went above and beyond to make our stay excellent.